The right time. The wrong person. The wrong time. The right person. A story of a woman and her friend, lost due to circumstances, whether intentional or not, will always be a story seeped in sorrow, strength, pain, conviction. Sometimes the women are reunited, different but braver, less fragile and more determined to find again what first drew them to each other. Other times, we can only remember, wistfully, of a person who once was an important part of our life. My Other Ex has skyrocketed to #4 on Amazon in its category. 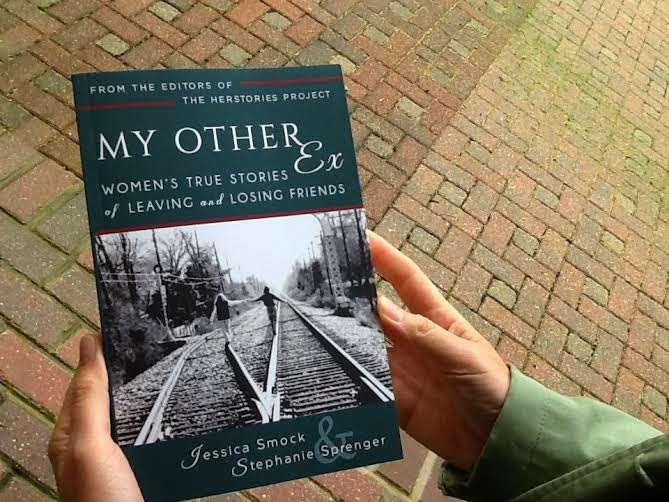 My Other Ex: Women's True Stories of Leaving and Losing Friends, edited by Jessica Smock and Stephanie Sprenger is available on Amazon. I am proudly giving away a copy. Please leave a comment, and I'll be picking a winner via random.org. I will email you for your address. And thank you, for being here, to share in the joy of celebrating the release of this much awaited work of female friendship. Amazing! Congratulations! This looks so, so good, and I'd be lucky to win a copy. I am so excited I know so many famous people. Losing a friend is a heartbreak different from any other and SO worthy of discussing, sharing, healing. This marvelous book should (SHOULD) be in every woman's bedside table drawer, glove box, and purse! It is a MUST read by some of the best lady writers around. Congratulations to all of the fantastic women who put this together! Gah! Pick me, pick me. I want to read this and would especially love it to be a copy from the Empress. Congrats. This is going to be such a great and timely read for me...tissues ready! Can't wait to read! I'm trying to let go of a friendship right now and I need some community around that. Congratulations on your publication and special kudos for the Amazon rank, that's excellent. I'd be honored to win a copy, please toss my name in the hat. Thanks. The book sounds amazing. I also had one of these experiences, and although we did eventually reconcile, it was never the same. This book comes highly recommended from a fellow writer, and I'd be very pleased to win a copy. The short story is my favored format and this topic resonates very deeply for me. Because you are so authentic and human in your excitement about the honor of publication--every time it happens for you!--you inspire us all and make us love you. I feel so grateful to have this connection with you; I'm learning much! Congratulations! THANK YOU, everyone. I might even give away two, because the book is that great. Thanks for your encouragement, and support. You are all so wonderful. I am sooo looking forward to reading this book, given my own stories of loss during a time of growth. Well done! I'm looking forward to reading it. Looking forward to reading this Alexandra! Lisann V: You've won the book! Please email me your address so I can send it to you!! Congratulations!